Supernova remnant 160,000 light-years away. Credit: NASA/CXC/NCSU/K.J.Borkowski et al. A bubble of x-rays generated by high-energy oxygen ions is said to be from a supernova explosion. However, it appears more like an electric discharge through dusty plasma. In a recent announcement from the Chandra X-Ray Observatory, a bubble of expanding gases from a stellar explosion is creating a spherical shockwave that is traveling through the surrounding interstellar dust at extremely high velocity. According to scientists, the shockwave has formed a “shell” of compressed gas where temperatures are so high that it is generating several frequencies of X-rays. In the image at the top of the page, red indicates low-energy x-rays, green is moderate-energy and blue is high-energy. 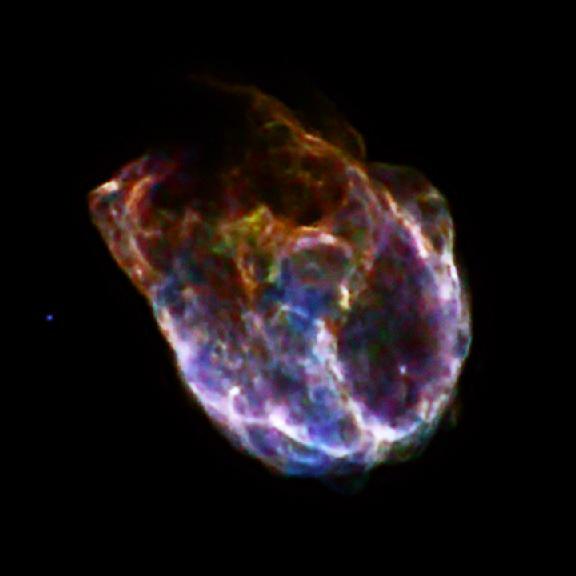 One unusual aspect to this particular supernova remnant is that it is rich in oxygen isotopes, something not normally present in interstellar nebulae or “gas bubbles”. It is the explosion of such large stars that is supposed to be responsible for the creation of all the elements in the universe beyond the simplest isotopes of hydrogen and helium. Indeed, the vast majority of what makes up planets, moons and planetesimals (presumably) orbiting other stars was forged through fusion as they “burned-up” their hydrogen fuel and converted it into heavier elements. Once the process created enough iron “ash” in the core, the star no longer supported its thermonuclear engine and it exploded, throwing the atomic debris into the galaxy. It is that hypothetical process that produces shockwaves in giant dust clouds, initiating further star formation as a chain-reaction in the galaxy. As we have written in many prior Picture of the Day articles, however, we do not live in a strictly mechanistic universe where things happen only when there are explosions, shockwaves, compressed gas, rebound, expansion or other kinetic and gravity-based forces. Rather, the universe is crackling with seething energies that exceed the powers of gravity and inertia by many orders of magnitude. It is electric currents in plasma that makes up what we observe. It is responsible for the abundant oxygen that is revealed in the green regions of N132D. Rather than an expanding shockfront of gases, the features shown in the Chandra image are lit by electricity passing through the dusty plasma. The x-ray radiation is typical of that given off by highly excited stars, indicating extremely strong electrical stress. The electric current generates x-rays when it passes through heavy ions in the plasma. 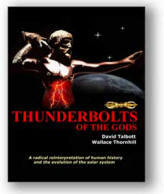 In an Electric Universe, all stars synthesize heavy elements in the concentrated plasma discharges of their photospheres. Supernovae are the result of a star effectively “throwing a switch” in the galactic circuit. The result is the same as an unintended circuit break in an earthly power grid where the stored electromagnetic energy in the entire circuit is suddenly focused at one point.